Democrats are losing this race. And they're thrilled about it. The party — and even some Republicans — say the results in Ohio suggest the GOP will have trouble holding onto its House majority this fall. 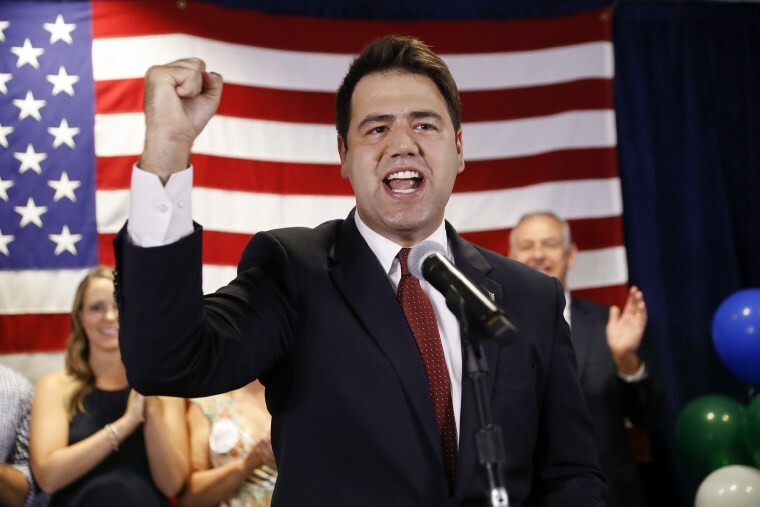 WASHINGTON — There are zero second-place finishers serving in Congress and Danny O’Connor, the Democrat in Ohio's high-profile special election Tuesday, finished second. But Democrats say the result is making them feel more bullish than ever about their prospects to flip the House in November. "I have never been more confident that we will take back the House," said Rep. Ben Ray Lujan of New Mexico, the chairman of the Democratic Congressional Campaign Committee. And O'Connor could still make it Washington, even if he can't close the 1,754 vote deficit against Republican Troy Balderson (thousands of provisional and absentee ballots have yet to be counted, making it too close to call). He'll have another shot in a November rematch, when students will be back on campus at Ohio State University and turnout is expected to be higher. But Democrats don't need O’Connor to win this fall. There are 68 and 79 GOP-held congressional districts that are more competitive than where O'Connor and Balderson are running — and Democrats need just 23 to take the House from the GOP. Most of those seats would turn blue if they swung as much as Ohio’s 12th did on Tuesday. "Nothing that happened on Tuesday night suggests that the environment is improving for Republicans. They barely held a traditionally GOP seat in Ohio," said Kyle Kondik, an analyst at the University of Virginia's Center for Politics, who added that other results showed "a House playing field that is expanding, not contracting,"
But don’t take his word for it, just listen to this Republican pollster. President Donald Trump can rightly tout the scoreboard, which shows the GOP winning six out of seven competitive congressional special elections this cycle. But the margins in those races tell another story. O’Connor topped Hillary Clinton's performance in the district by more than 10 percentage points, and he beat the district's underlying partisan tilt by about 13 points. That's in keeping with what has happened in every other special election of the past two years, including in dozens of state legislative races. "Imagine what will happen if these trends continue in November in districts where Republicans already were facing a challenge," said Patrick Murray, the director of the Monmouth University Polling Institute. "As of right now, our polling suggests that's exactly what the landscape will look like." All the congressional special elections have played in out deeply conservative districts that Democrats were not able win (with the exceptions of victors Rep. Conor Lamb in Pennsylvania and Sen. Doug Jones of Alabama) even with those swings. But the map will be much more favorable for Dems in November. In Ohio’s 12th, for instance, Trump won by 11 percentage points. The last Republican to represent the district won it by 36 percentage points less than two years ago. And, aside from one two-year term in early 1980s, it's been held by Republicans since 1939. At the same time, there are 25 Republicans who represent districts that Clinton won, and 79 who hail from districts where Trump got a smaller vote share than he did in Ohio's 12th. And there were more bad omens for Republicans in other states that held elections Tuesday night. In Eastern Washington, a Democrat nearly surpassed Rep. Cathy McMorris Rodgers — the fourth-ranking Republican in the House — in the state's top-two primary system, while two other Republicans looked unexpectedly weak. Two of those districts were on Democrats' radar, but the third was not. And the fact that Democrat Tom Foley was ousted from the very district in the 1994 Republican wave while he was speaker of the House may add to the sense of foreboding for Rodgers, even though she is still favored to win this fall. In Kansas, Democratic turnout more than doubled from 2014, the most recent midterm year, in the statewide gubernatorial primary (152,0856 in 2018 versus 66,857 in 2014) and nearly tripled in the competitive 3rd Congressional District (61,321 in 2018 versus 20,713 in 2014). And in Michigan, more Democrats voted in Tuesday's gubernatorial primary — 1,122,700 with a few precincts still out — than any primary in the past 18 years, according to the secretary of state's office. Of course, the political landscape could change drastically before November, and if the 2016 election taught us anything it's that even strong data can lead to wrong conclusions. But right now, experts in both parties don't see that happening. "I've worked in Ohio presidential and senate races for Republicans and the idea of (Ohio's 12th) being a close race is sort of like hearing gravity is a regional phenomena," former top Mitt Romney strategist Stuart Stevens said on Twitter. "It's not how the world is supposed to work."